Hair removal with a laser has become one of the most popular elective treatments in America. It is an effective option for the long-term reduction of hair follicles on the body and face. This procedure frequently leaves the skin feeling and looking smoother and produces long-lasting results compared to other common methods. Board-certified plastic surgeon Dr. Michael J. Brown and his aesthetic team at The Loudoun Center for Plastic Surgery in Ashburn, VA performs safe and fast laser hair removal services with the CoolGlide Nd:YAG laser for women and men in frequently needed areas, including the arms, legs, back, face, chest, armpits, and bikini area. On the day of your laser hair removal appointment, you can lie in a private treatment room as areas of your face and body being treated are washed to eliminate oil, dirt, and moisturizers. During the procedure, a team member will stretch out the area to create a clear pathway between the root of the hair follicle and the laser. The laser's energy will focus on and disable the follicle, which stops the hair from growing again. Usually, you will need to receive 3 – 5 treatments over 3 – 4 weeks to experience your ideal results. Your appointments are staggered to give the affected areas a chance to heal. It also allows time for follicles in the dormant phase to reach the phase of active growth so the laser can be effective. The state-of-the-art technology we use at The Loudoun Center for Plastic Surgery targets only the hair follicle to preserve the skin and other tissue in the area being treated. Although the treatment is mostly gentle, the treated areas of your skin may look like it has a light sunburn since lasers are used. After your session, you are able to go back to all normal activities, but you need to avoid heavy activity or lengthy exposure to the sun for at least a day to let the treated skin recover. At home following your appointment, we suggest soothing creams or ice packs to treat any mild discomfort. The cost of a laser hair removal procedure will vary, depending on the amount and size of the area/areas being treated along with how many sessions may be required and how much time they require. Though laser hair removal may be more expensive than waxing, it is generally much more effective and requires less frequent maintenance. During your consultation, we will create a personalized treatment plan for you that will include the total number of recommended sessions and pricing options. Though it is known to be a solid solution for hair removal, there is some potential for some hair growth following laser hair removal, and this occurs in the areas where the laser technology did not hit. However, patients do find that the majority of their hair will be gone following a series of treatments and any hairs that do pop up are easy to manage. Additional laser treatments can be provided to eliminate any new growth and stragglers. Since hair growth has varying cycles, some hair may be in a growing phase while others may be in a dormant phase. Therefore, multiple laser hair removal sessions are often needed to target each hair and follicle during the growing phase. Since the follicle is not affected by shaving, hairs that grow can be shaved between treatments. Scheduling sessions over a few weeks also help to remove each follicle more effectively since it is harder to remove a dormant follicle. Though some minor discomfort may occur, laser hair removal is not considered a painful procedure. Typically, patients will experience a slight stinging sensation as the laser targets the hair follicle. A numbing ointment may be applied to the skin's surface prior to the treatment to allow for a more comfortable procedure. At The Loudoun Center for Plastic Surgery, we are proud to offer the latest in hair removal technology through the Cutera CoolGlide system. The CoolGlide laser includes a cooling mechanism to allow the skin to be protected. It can also treat a large area at once, allowing it to be more effective. It is FDA approved to reduce the amount of hair in the treated area. 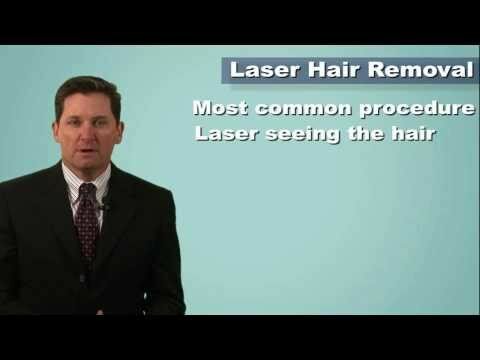 If you are tired of spending energy, time, and money on bleaching, plucking, shaving, and waxing, make an appointment to find out more information on laser hair reduction sessions at The Loudoun Center for Plastic Surgery in Ashburn, VA. Laser hair reduction by plastic surgeon Dr. Michael J. Brown will help you achieve skin that is smoother by treating unwanted follicles on the body and face.